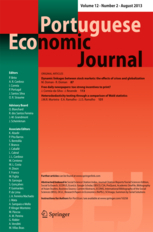 The Portuguese Economic Journal aims to publish high-quality theoretical, empirical, applied or policy-oriented research papers on any field in economics. We will enforce a rigorous, fair and prompt refereeing process. The geographical reference in the name of the journal only means that the journal is an initiative of Portuguese scholars. There will be no bias in favour of particular topics and issues.